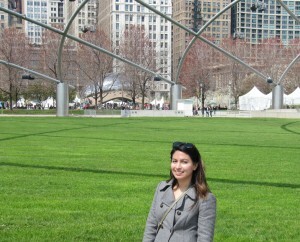 Andrea Minano at the Association of American Geographers (AAG) Annual Meeting in Chicago, Illinois. 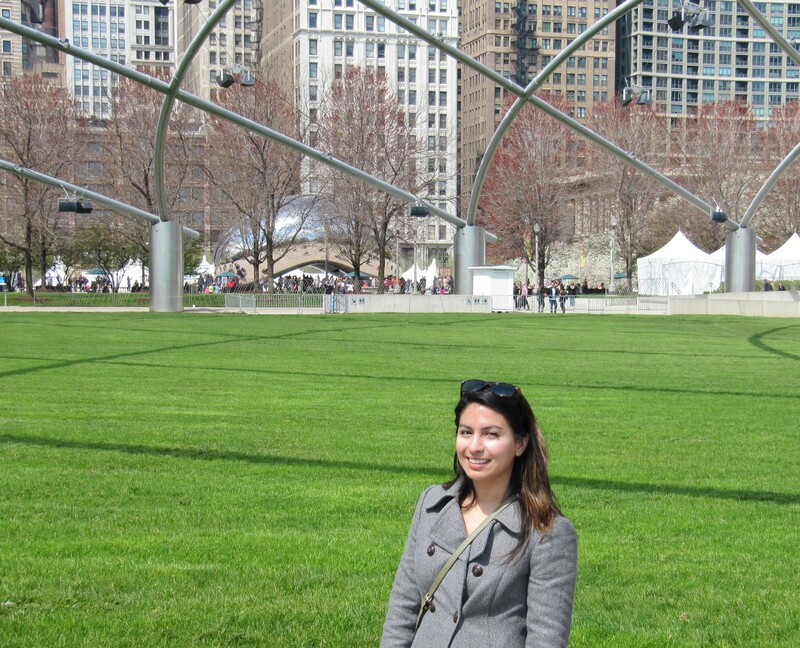 From April 21 to April 25 2015, Geothink’s students, team, and collaborators presented their research and met with colleagues in Chicago, Illinois at the now concluded 2015 Association of American Geographers (AAG) Annual Meeting. Over the week, Geothinkers gave 16 presentations, ran a panel discussion, presented posters, organized and chaired four sessions, and gave two plenary speeches. See who attended here. Of his own work, Harrison reported positive results as well. Find his abstract here and below. Others held a similar opinion of the conference that attracted over 4,500 presentations, posters, workshops, and field trips by leading scholars, experts, and researchers in the field. Geothink collaborator Muki Haklay, professor at University College London, also hosted the session entitled Beyond motivation? Understanding enthusiasm in citizen science and volunteered geographic information and two more sessions on OpenStreetMap Studies. He wrote extensively about these sessions and the conference on his own personal blog as well. Geothink held its pre-conference workshop on Monday, April 20 entitled “Citizen-Government Relations for a Digitally-Enabled and Location-Aware World.” Presentations included those by Scott Bell, Piotr Jankowski, Renee Sieber and one by Ashley Zhang, Rob Feick and Stephane Roche among others. Discussions included plans for two forthcoming books, the first an empirical book devoted to findings and the second a compilation of essays on the future of the Geospatial web and open data. Find out more about the presentations and plans in the most recent edition of the newsletter. For some, giving a presentation at the AAG itself led to important reunions with colleagues while also providing opportunities for new experiences. The AAG annual meeting has been held every year since the association’s founding in 1904. Please find abstracts for presentations mentioned in the article below. This paper situates smart cities within a larger global movement of the sharing economy. The sharing economy, exemplified by services such as airbnb.com and Uber, has emerged as a new niche in entrepreneurial capitalism and global consumer culture that targets highly mobile populations, and exploits web 2.0 mapping technology and location based services that have become increasingly necessary to navigating smart cities. This has not only brought forth questions of how incumbent service providers such as hotels and taxi companies will respond to such competition in the market, but also the underlying regulatory challenges for municipalities, particularly as many sharing economy enthusiasts press for libertarian self-regulation. This paper seeks to: 1) situate smart cities within a sharing economy by focusing on the cultural and affective relations between cities, global capitalism, and geo-spatial media; 2) outline the discourses of regulating the sharing economy as it presented by incumbent service providers, municipalities, and sharing economy entrepreneurs; and 3) to present preliminary findings of a comparative study of various North American cities as they have either sought to embrace, regulate, or reject the sharing economy. Volunteered geographic information (VGI) represents the contribution of local knowledge by citizens through the pathways of the participatory geospatial Web (pGeoweb). These crowdsourced data and user-generated geographic content are gaining influence on government operations, urban and regional planning, and a broad range of societal decisions. Despite this growing influence, there are few conceptualizations of VGI and the pGeoweb. This poster summarizes our research in three directions: (1) taking a holistic systems perspective on the projects, participants, and Geoweb components employed in creating VGI; (2) examining the effectiveness of public participation on the Geoweb through the study of engagement, empowerment, and enactment processes; and (3) classifying user contributions by data formats and contents types. Some of our results include the view of VGI as an information product that is well within the realm of GIS concepts of data input, management, analysis, and presentation. We also argue that the term “VGI”, as presently used, should be replaced by volunteered geographic “data” (and/or “content”). Even though pGeoweb projects are often bottom-up initiatives, we posit that there still is a “provider” with (sometimes covert) authority over the project. Finally, we characterize pGeoweb projects by their data/content types, including locations, categorical observations, numeric measurements, parameter settings in models, annotations, narratives, stories, media files, and opinions. Accordingly, we distinguish crowdmapping, citizen sensing, citizen reporting, map-based discourse, and geosocial media applications. Overall, these three interrelated conceptualizations will strengthen the role of Geographers and GIScientists in the burgeoning field of VGI and pGeoweb research and development. This entry was posted in In The News and tagged AAG, AAG2015 on May 12, 2015 by Drew Bush.